Rev. 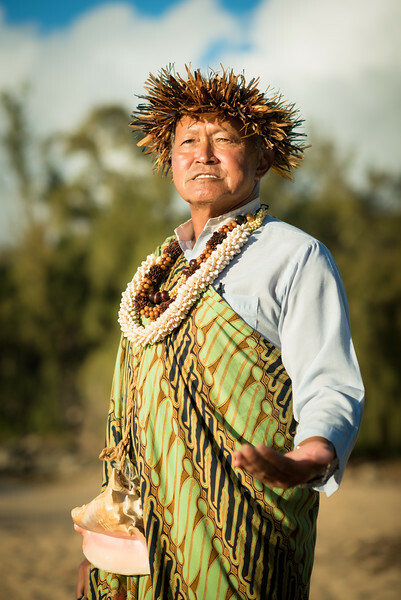 Laki Pomaikai Ka’ahumanu is the great, great grandson of Queen Ka’ahumanu, wife of King Kamehameha, who was the first to unite the islands of Hawaii under one kingdom. Having Rev. Laki perform your traditional Hawaiian wedding or vow renewal ceremony not only provides you with the authentic Hawaiian rituals of chanting, blowing of the conch shell, and Hawaiian prayer… but also adds a truly royal touch: A minister who is a direct descendant of the last royal family to govern Maui and Hawaii. My Fiancé said that Ernest performed the most beautiful ceremony that they've ever witnessed and we are all just so happy! Reverend Ernest Pua’a was born on Oahu and raised on the friendly island of Moloka’i before moving to Maui in the late 70′s. 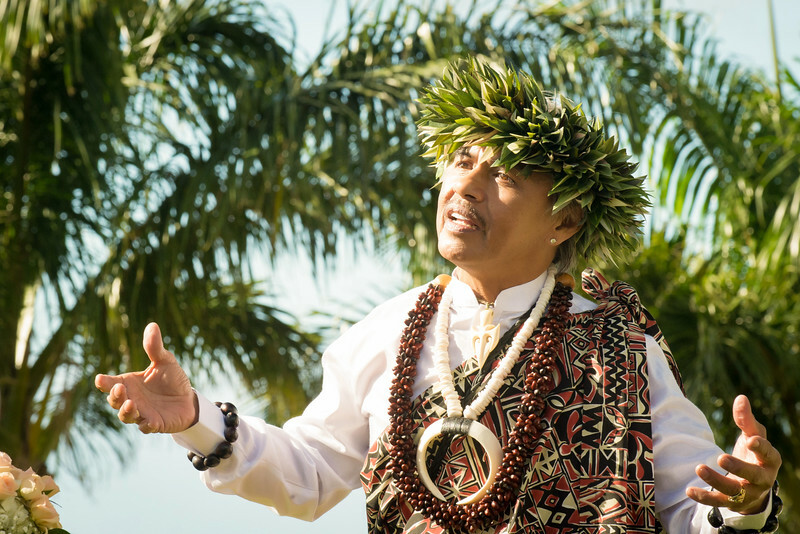 In the early years of his life, his father, an accomplished slack key guitarist, taught him how to play the guitar; while his mother taught him to sing. 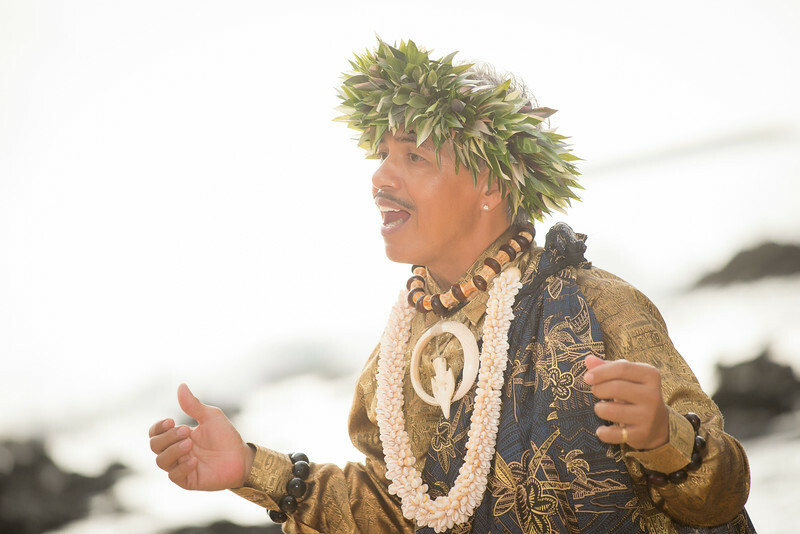 Hawaiian music has therefore always been a big part of his life. AKA “Da Barefoot Warrior” he has been one of the most sought after musicians on Maui, playing for many wedding couples and in many different venues. 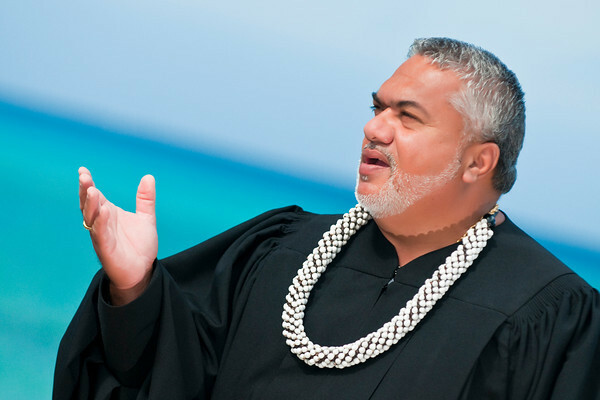 As time went on, one of Maui’s great reverends Pastor Laki Kaahumanu encouraged him to become an officiate and ordained him. Ernest Puaa is a wonderful, and kind hearted person, a God loving human being and well known for his caring manner. 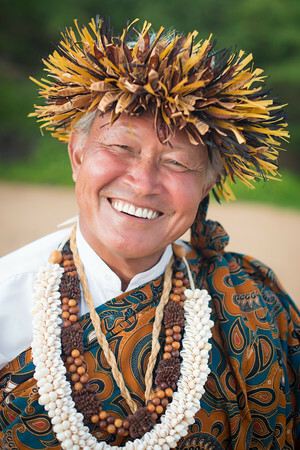 He finds joy in sharing his love and Aloha spirit with so many different kinds of people; who were once strangers in his life and are now part of his “Ohana” which means “Family.” What a blessing to be married by this truly Hawaiian spiritual man who finds pleasure in knowing that he is doing exactly what he was put on this earth for. Ernest's Fee for the Southside is $550.00 and includes Three songs played and sung on his Ukulele. Ernest's Fee for the Westside is $500.00 and includes Three songs played and sung on his Ukulele. Aloha, my name is Rev. Adam Gomes and I am blessed to have the awesome privilege of performing weddings for nearly 17 years. I've been married for almost 40 years. I have 2 daughters, 3 granddaughters, and 1 great-granddaughter. I consider myself very blessed to have the family that I have. I love them with all my heart. I was born and raised here on the island of Maui. I consider this island not only my home, but an island with majestic mountains, beautiful beaches, sacred places, breath-taking sunrises and sunsets, but most of all its people who posses so much love and aloha. Every wedding I perform is like a gift to me, as I am a vessel in joining two lives as becoming one, making that day special and memorable for each couple. “This is the sight for which I have longed. Now that you have come, love has come with you.” Aloha and welcome! Groom and Bride, we are gathered here to celebrate your marriage. This day you have chosen to affirm your love for each other with spoken words, with prayer, and with the sharing of symbols. Marriage is a commitment to Life…to the best that two people can find and bring out of each other. It offers opportunities for sharing and growth no other human relationship can equal, a physical and emotional joining that is promised for a lifetime. Within the circle of its love, marriage encompasses all of life’s most important relationships. A wife and husband are each other’s best friend, confidant, lover, teacher and listener. There may come times when one partner is heartbroken or ailing, and the love of the other brings healing and steadfastness to the sturdy foundation that allows the marriage covenant to be established. Marriage deepens and enriches every facet of life. Happiness is fuller, memories are fresher, and commitment is stronger. Marriage understands and forgives the mistakes life is unable to avoid, and yet it encourages and nurtures new life, new experiences and new ways of expressing love through the seasons of life. When two people pledge to love and care for each other in marriage, they seem to create a spirit unique to themselves, which binds them closer than any spoken or written word. Marriage is a promise, made in the hearts of two people who owe each other, and this will take a lifetime to fulfill. 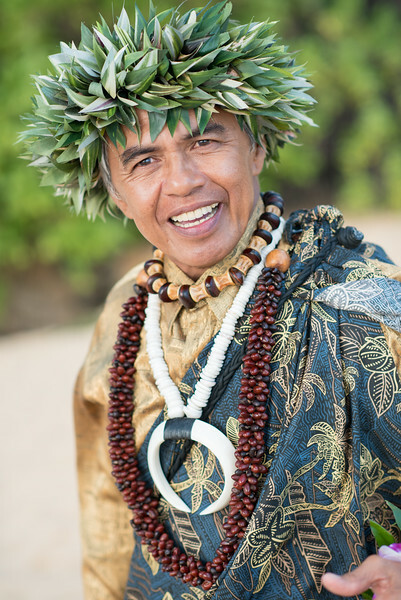 For those of us who call Hawaii our home, the flower lei is a symbol of love. It is also a symbol of things that are fragile and temporal. A flower lei will last a day or two and then it is gone. 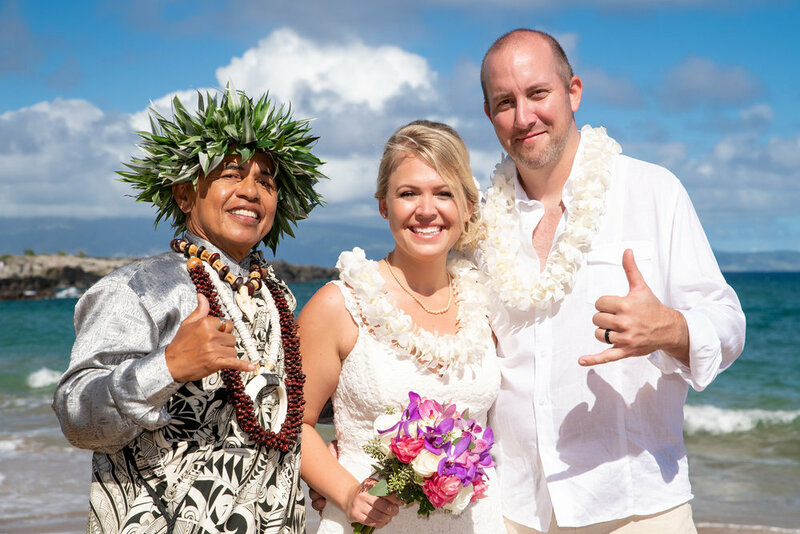 Our lives are like the lei within the span of eternity, therefore, live with tender consideration for each other, continue to love one another and your marriage will last. 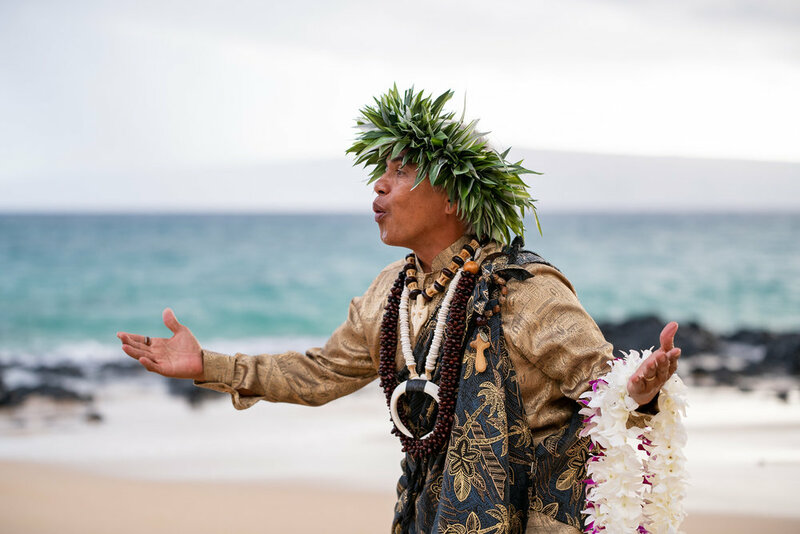 May the leis you now offer each other be recognized for the love that you have for one another. 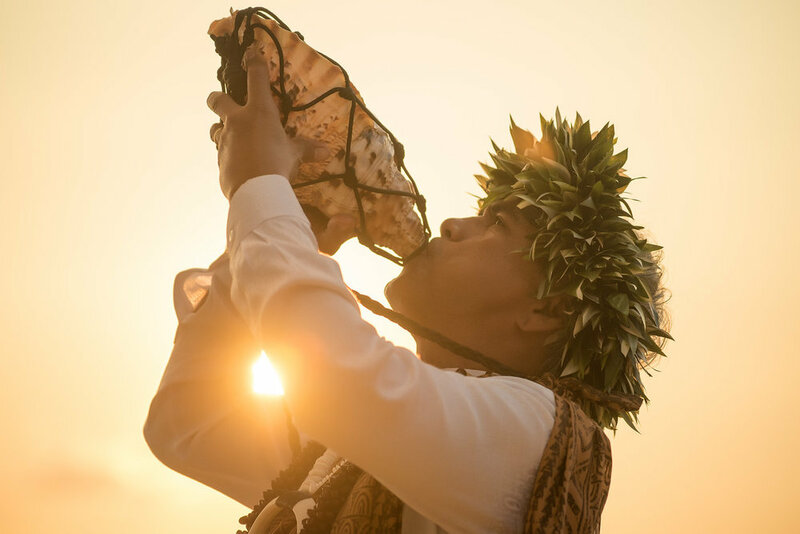 The Hawaiians have a traditional saying: “Honi Ka Waha!” Kiss him/her on the mouth. Groom, do you wish for Bride to be known as your wife? If so, please say “I do”. Bride, do you wish for Groom to be known as your husband? If so, please say “I do”. Groom and Bride, do you promise to let your love for each other grow, as it will and as it must, so that in the years to come you will renew your acceptance, your understanding and your trust of one another? If so, please say “we promise”. I, Groom, take you, Bride, to be my wife. I promise to love you, honor you and cherish you. I will be your companion. I will share my strengths and achievements. I promise to respect you and be your friend. For better or for worse, for richer or for poorer, in sickness and in health, for as long as we both shall live. I, Bride, take you, Groom, to be my husband. I promise to love you, honor you and cherish you. I will be your companion. I will share my strengths and my achievements. I promise to respect you and be your friend. For better or for worse, for richer or for poorer, in sickness and in health, for as long as we both shall live. The wedding rings are a symbol of longevity in the marriage covenant. The circle of the ring symbolizes the never ending circle of love and commitment that you are making. Always see the best in each other, and each day that you are together, when you look at the beauty of these rings, remember the love that you have for each other, is forever. Bride, I give this ring to you as a sign of my love. I give myself to you to be your husband. From this day forward you shall not walk alone. I feel so honored to have you as my wife. I vow to love you and sustain you in the Covenant of our marriage, for as long as we both shall live. Groom, I give this ring to you as a sign of my love. I give myself to you to be your wife. From this day forward you shall not walk alone. I feel so honored to have you as my husband. I vow to love you and sustain you in the Covenant of our marriage, for as long as we both shall live. We have been witnesses to this special day, therefore, I, and those of us here with you, recognize that you have become husband and wife, and we and all of your family and friends shall honor you as the same from this day forward. Imau aku kaloko maika’i o ka haku o iesu cristo me kealoha o keakua a mekalauna puana o ka’uhane hemolele me ka ko apa’u. May the grace of our Lord Jesus Christ, and the love of God, and the communion of his spirit be with you always. May God bless you and keep you. May God’s Face shine upon you and be gracious unto you. May God lift up his countenance upon you and give you peace. Amen. Groom and Bride, remember this day here in beautiful place, Maui, Hawaii, with joy and thanksgiving, and may you love to live and live to love! Now therefore, by the authority given unto me as a minister of the gospel, and by the laws of this state, I now pronounce that you are husband and wife, therefore, you may kiss your bride! I present to you Mr. and Mrs. Groom and Bride! Whom God hath joined together, let no man put usunder! Aloha e! Aloha e! Aloha e! Richardo Hanakoo was born and raised in Indonesia in an orphanage and educated by the Dutch. He is a Conzega University graduate and was involved with orphanage charities in South America and Indonesia most of his life. His spiritual journey started from the days of the discipline in the orphanage as a Jesuit student to that magical discovery of the greatness of the spiritual universe. It has given him the wonderful opportunities to help many with their own spiritual beginnings. 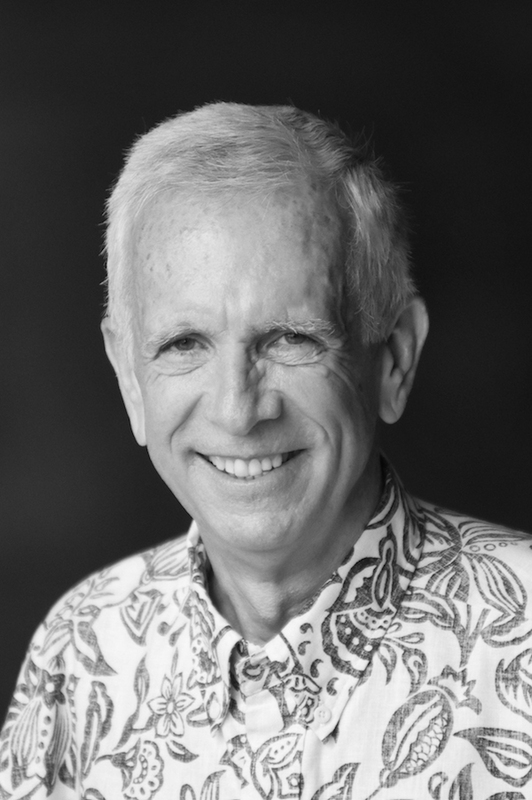 Richardo came to Maui 11 years ago and right away felt the glory of paradise that is everywhere here in Maui and realized that he has come home. 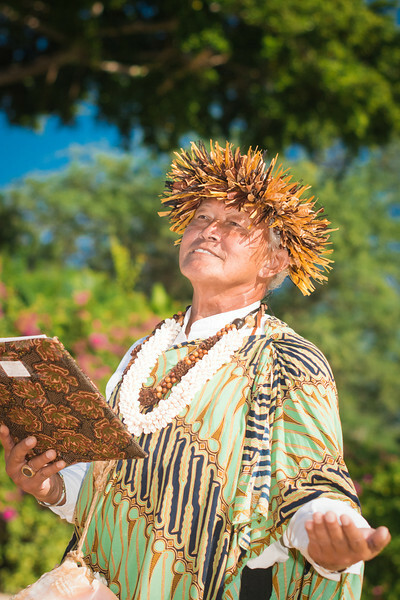 He is a non-denominational minister and has a way of embracing and touching everybody with that joy and Aloha that is so special of Maui. He feels that the magical moment of your wedding ceremony must be a memory that last a life time. 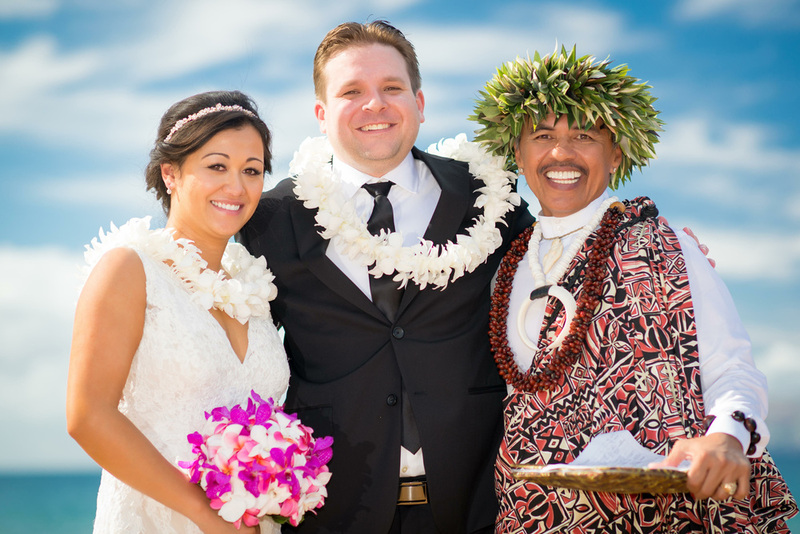 Kyle Evanko is a five year Maui Resident who loves helping couples get married. Kyle can do a very simple marriage or vow renewal for you. 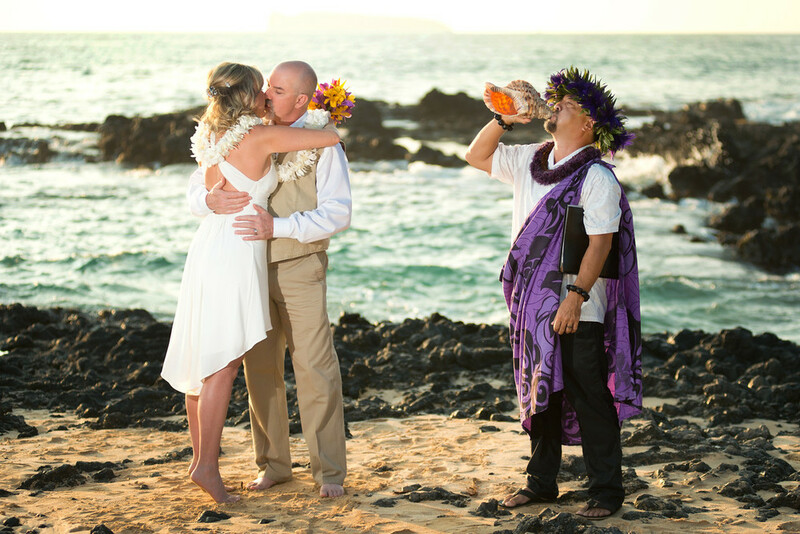 While not a native Hawaiian, Kyle can blow the Hawaiian Pu'u (conch shell) before and after your ceremony. 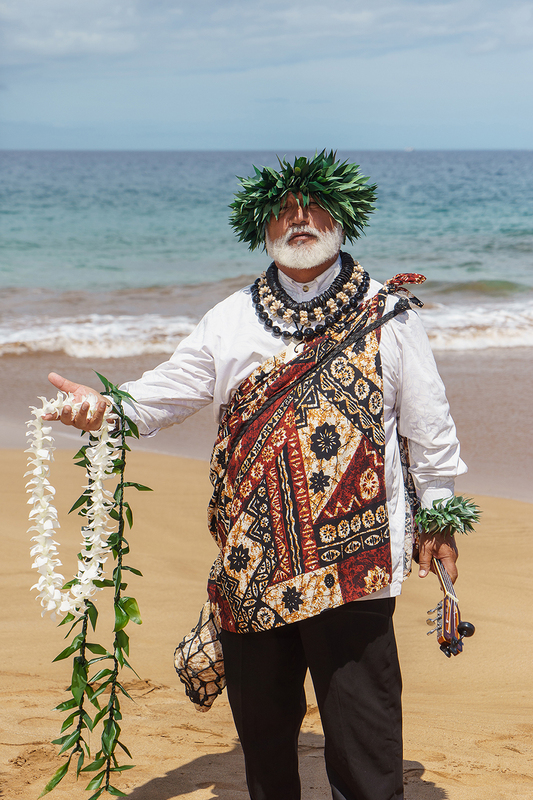 Kyle will explain the meaning of the Hawaiian Lei exchange and help you exchange your first gifts to each other. Kyle is also one of our Photographers, he can do your ceremony and then take pictures afterwards. Kyle is a perfect choice for those couples who want a simple ceremony with a few photos. Pastor James “Kimo” Kirkman’s faith has brought him to the ministry where he has been serving for many years. He is a devoted family man with a great sense of humor and his ceremony is always performed from the heart. 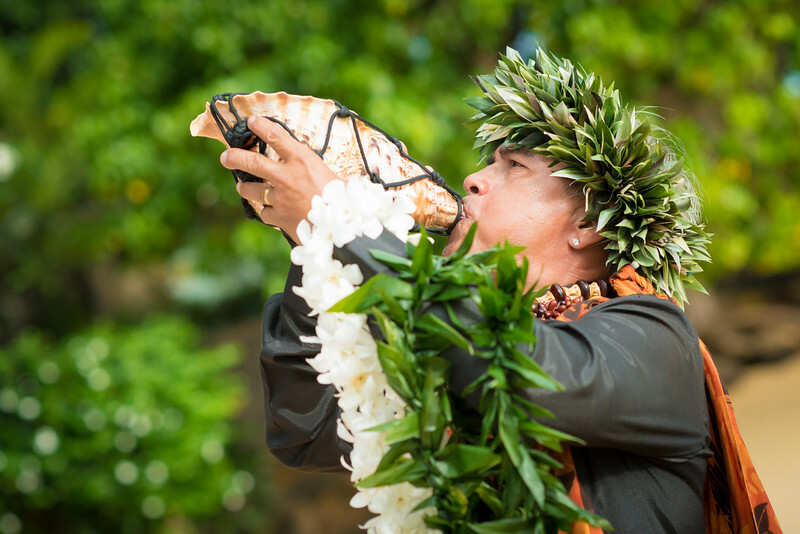 He opens every marriage celebration with the blowing of the conch shell, the oli (Hawaiian chant) and closes with a Hawaiian prayer. He will perform religious, non-religious, vow renewals and is open to travel wherever needed. Kimo's Fee is $470.00 for South and Westside.